Running away is never the answer. It can be tempting sometimes, but ultimately, your problems just grow bigger when you run away from them. That’s a hard lesson that Barry Allen, The Flash, has learned, which is why he’s decided to run TO the danger, instead of away from it. And, of course, The Flash is well equipped for running full speed into the most dangerous of situations. Perhaps you’re looking for a costume that will help you charge headfirst into the world. Maybe, something that will make you feel like a member of The Justice League? Well, look no further than this officially licensed Grand Heritage edition of The Flash costume. 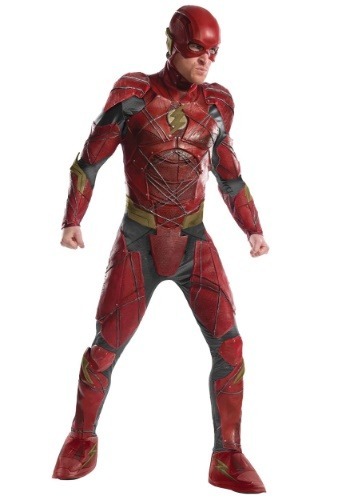 This highly detailed Flash costume brings the iconic style from Zack Snyder’s Justice League film to life. The costume comes with a black, textured jumpsuit that has bright red armor pieces attached to the chest, arms, and legs. The front of the costume has sculpted muscles, along with a gold lightning bolt symbol right between the pectoral muscles. Faux silver “wires” are also molded into the front armor. The sleeves feature gauntlets, bicep guards, and shoulder armor. The legs end in boot covers, which make it easy to wear any pair of shoes with this costume. The mask faithfully recreates the one worn by Ezra Miller. It has a smooth top with holes for your eyes. It also has gold accents on the sides of the head. If you want the ultimate Flash costume that will have you feeling fit enough to tangle with any problem, then you want this Grand Heritage model. It comes with everything that a fan could want to become the superhero… well, aside from a strong connection to the Speed Force, that is.